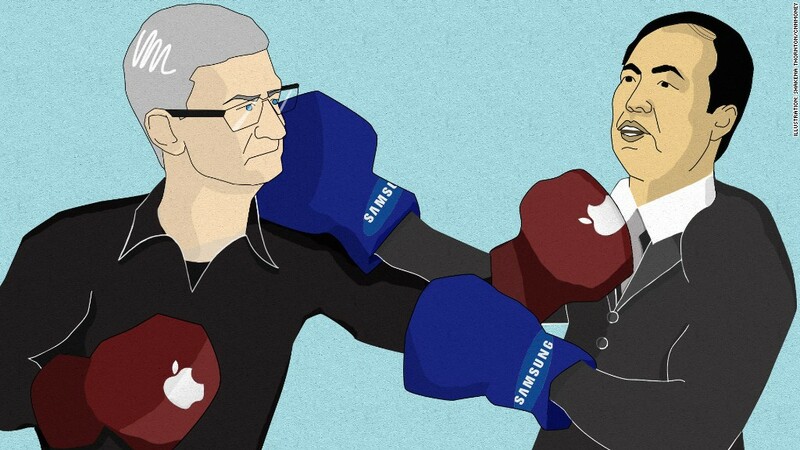 Apple CEO Tim Cook (left) and Samsung co-CEO JK Shin are beating one another up in patent courts. Apple and Samsung's fiercest battle isn't playing out in the smartphone market. The companies are currently embroiled in dozens of high-stakes patent disputes, four of which are playing out in the United States. Billions of dollars are on the line, and the titans are fighting to take each other's products off the shelves. The good news for consumers is that the trial proceedings in such disputes typically take so long that the products in question are often long obsolete by the time a judge rules on the case. The latest ruling is expected to take place on Friday, when a federal court will decide whether to ban the sale of some older Samsung smartphones in the United States. Here's a look at the serpentine path of Apple v. Samsung, and its many spinoffs. Round 1: The Apple v. Samsung saga began in April 2011, when Apple (AAPL) accused Samsung of "slavishly" copying the iPhone and iPad. Samsung replied by counter-suing Apple, accusing the Cupertino company of infringing on its software patents. In August 2012, a California jury found Samsung had infringed on the most of the patents in question -- including the design of the hardware and software features like double-tap zooming. The jury recommended that Apple be awarded more than $1 billion in damages, a figure which U.S. District Judge Lucy Koh later reduced by more than $450 million due to a "jury error" in determining damages. Koh also refused to ban the eight Samsung smartphones in question. Both Apple and Samsung have appealed the ruling. "It is unfortunate that patent law can be manipulated to give one company a monopoly over rectangles with rounded corners," Samsung scoffed. Round 2: In a separate battle, Samsung sued Apple in a special court in June 2011. Samsung alleged that the iPhone 4 and iPad 2 -- both of which are still on store shelves -- violated the Korean company's patents. The International Trade Commission ruled in favor of Samsung in June 2013, and said the Apple phones in question couldn't be sold within the United States. Companies like to bring their cases before the ITC because it is generally easier to get a ban on the sale of patent-violating goods than by going through the traditional patent court system. But the ITC is required by law to send such "exclusion orders" to the president for a 60-day review. In an extremely rare move, President Obama did veto the ITC's order just before the review period was up. Round 3: One week after Samsung sued Apple in the ITC court, Apple filed a counter-suit citing several patent infringements, including on the hardware design of the iPhone. The ITC made a preliminary ruling in favor of Apple, but that doesn't necessarily mean anything. In the previous ITC case that ultimately ended in favor of Samsung, the preliminary judgment had exonerated Apple. Winner: We'll find out Friday. But if Obama was willing to veto a ban on Apple, it's possible that he would do the same if the ITC rules against Samsung. Round 4: In February 2012, Apple filed another lawsuit in California district court accusing Samsung of infringing on utility patents in its newer products. And so the counter-suit dance played out again, with Samsung shooting back that "all generations" of the iPhone and iPad infringe on its own patents. Apple, meanwhile, added new Samsung products to its list of infringing products about as quickly as they were released on the market. The court soon grew tired of this, and recently denied Apple's bid to add Samsung's Galaxy 4 phone to the case. Winner: We'll see. The second Apple vs. Samsung is slated to go to trial in March 2014.